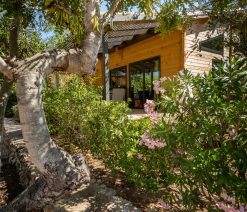 Choose the chalet near Peñiscola that suits you. And enjoy your cheap holidays in Spain on the Costa Azahar in seaside camping with pool! For your holidays on the Mediterranean, we offer cheap cottage rentals in Spain. Our wooden Wood Home chalets occupy individual wooded plots of 120 to 150 m², surrounded by lawns and isolated by hedges to ensure everyone a space for relaxation and privacy. Your cottage for rent in Spain in Peniscola is also equipped with an electric barbecue on which you can prepare your grill. 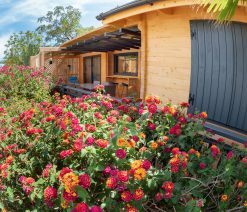 Chalet rental in Peniscola at L’Orangeraie campsite is an ideal starting point to enjoy the Azahar coast and visit the northern region of Valencia. By staying in the cheap camping in Spain you can also relax around the pool. 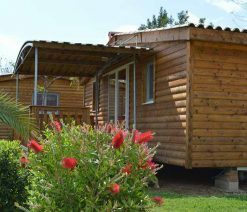 To spend a cheap holiday on the Costa Azahar in outdoor camping with maximum comfort, enjoy our spacious accommodations in Chalet fully equipped, which can accommodate up to 6 people.